TVonics DTR-HD500 review | What Hi-Fi? Usually, the main specifications of a Freeview HD PVR include a decent-sized hard drive for storing recordings, an HDMI output, an ethernet socket and a USB input or two. The 500GB TVonics ticks all these boxes and then some. If you're unlucky enough to own a TV with only one HDMI input but happen to have a DVD/Blu-ray player and an HDMI-wearing games console, then the ‘HD500 is ideal. The PVR sets itself apart from the rest of the crowd, not just because of its slanted, wedge appearance, but also the presence of two HDMI inputs. Useful for some, a moot point for those who own more modern TVs or plug their kit into a home cinema amp, but it's still a nice feature to have. 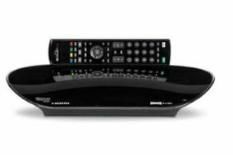 Head over to the website (www.tvonics.com/dolby) and you can download a software update that enables the machine to transcode Dolby Digital signals as and when the high-definition programmes allow. The remote isn't the flashiest of wands, but it's perfectly functional and, save for the odd slow response, operating the machine is a pleasant experience. The EPG is very green, with different shades of the colour representing channels and programmes, but in reality this doesn't make things especially complicated. Hit the record button to start recording to the hard drive and, where possible, you're also given the option of recording a whole series. You can then access recordings through the system's library, where you'll find a clear, easily decipherable list of everything stored on the hard drive. It has to be said that picture quality is mightily impressive and up there with the Award-winning Humax HDR-FOX T2. Of course, it's always nice to watch pristine high-definition programmes, but even standard-definition looks remarkably stable and detailed. Images are punchy and vibrant with little sign of picture noise. Sound quality is up to scratch too, with a good sense of solidity and fine detail levels. TVonics has made some impressive PVRs in the past and it's produced the goods again with this Freeview HD model. The 'HD500 is up there with the very best.